The report of a gun rings out in the middle of the dusty town square as one of the bandits takes a pot shot at John Wayne’s back. Wayne (or Clint Eastwood, if you prefer) spins around, whips out his pistol, and blasts the bandit away—only for the rest of his cohorts to materialize out of the upstairs windows of the saloon, behind the horses’ watering trough, and out of the door of the local sheriff’s office (who everyone knows is dirty). Wayne and his trusted companion hunker down, some sage brush rolls through the dirt street, and the entire downtown is instantly transformed into a shooting gallery. Yes, we all know the Wild West of movie lore: where rules are few and the people to enforce them–or willing to enforce them–are fewer. Over the course of my road trip last summer, I saw almost every approach to mountain biking trail access imaginable: well-established destinations with hundreds of miles of trail, all open to mountain bikes, with more singletrack on the way; locations with decent trails already that are planning major expansions to attract more riders to the area; areas where plenty of singletrack trails exist but virtually none of which are open to mountain bikes; and finally, places where the legality of mountain bike trails is dubious and indeterminate, and where an implicit don’t-ask-don’t-tell policy is in effect. The latter is Los Angeles, California: the Wild West of mountain biking. 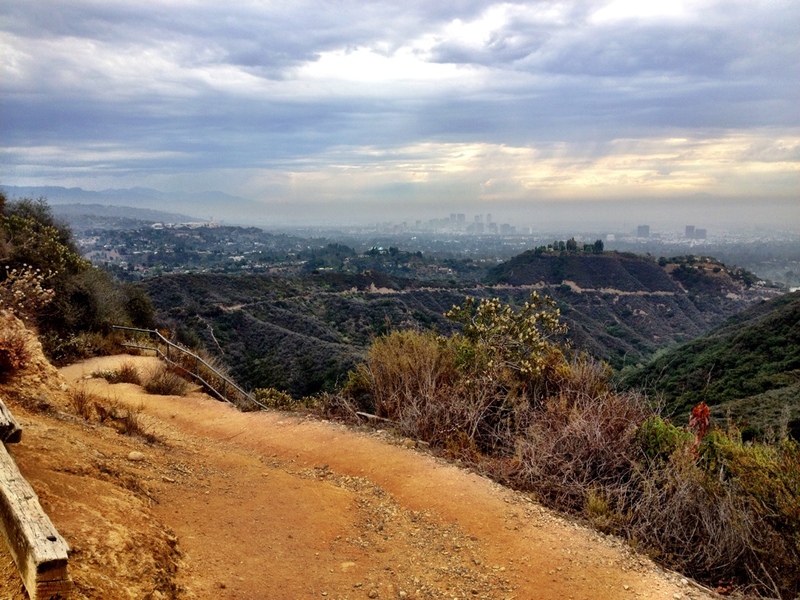 Backbone Trail in the foreground, downtown Los Angeles skyline in the background. When heading out to mountain bike in the Los Angeles area, be prepared to take the law into your own hands. There is so much ambiguity about whether or not mountain bikes are permitted on most trails, I’m not even entirely sure where to begin. 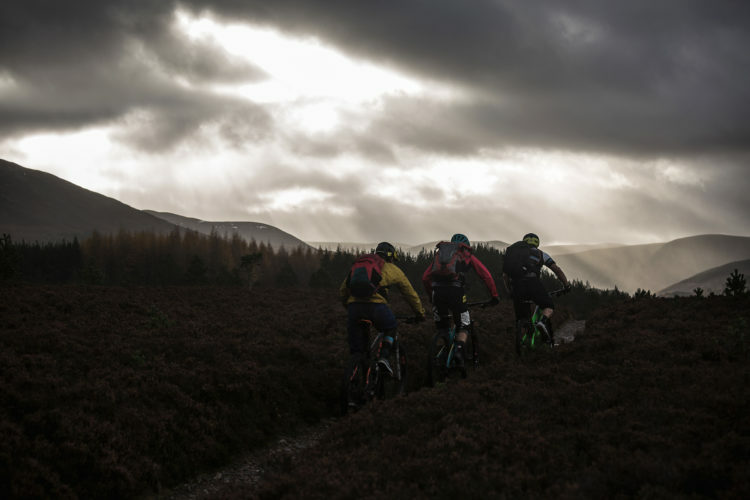 To start, there is incredible disagreement between all published sources about whether or not certain trails are open to mountain bikes. For instance, several of the rides I chose to do were based on a 10-year-old Falcon Guides guidebook, but when I bought a National Geographic Trails Illustrated map for the area, it claimed that most of the trails I was heading out to ride were off limits to bikes. 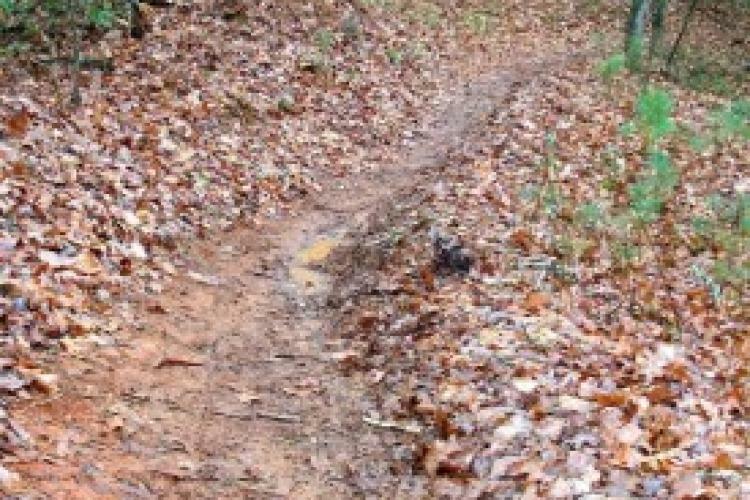 Which leads me to my second point: upon arriving at the trails, there is little indication about who is and who is not allowed on said trails. Really, you can never tell in LA before you roll up to the trailhead how much signage there will be. 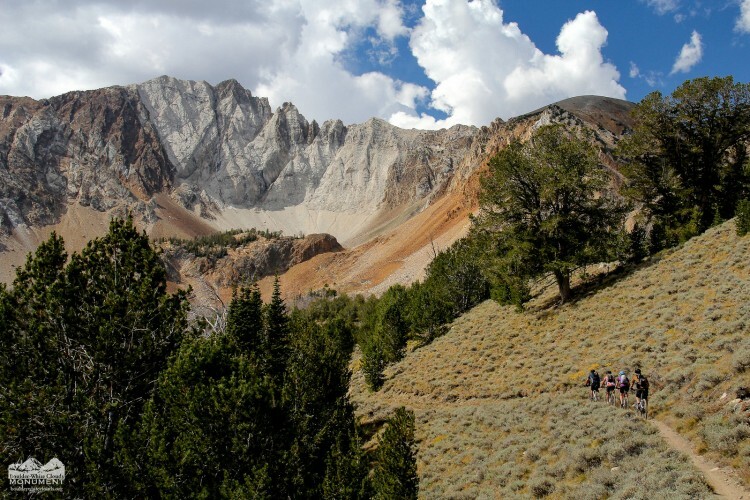 Most of the trails had little to no signage denoting what user groups could legally use the trail, and if they did indicate user groups, they often didn’t indicate who was not allowed to use it. 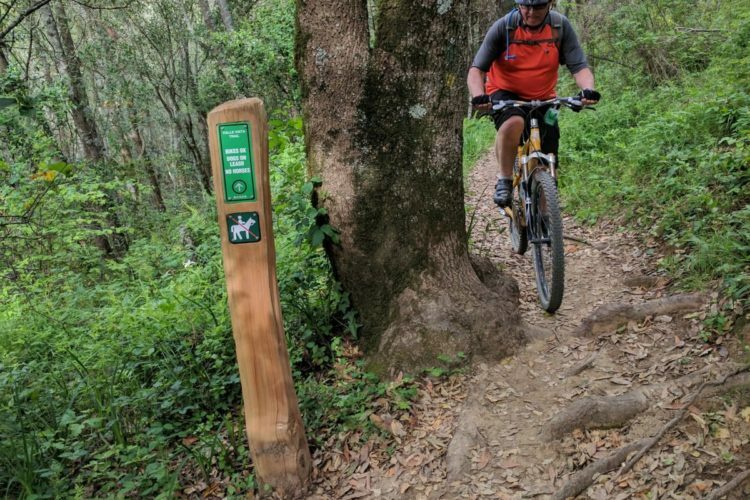 That is, sometimes you would see a sign with a picture of a dude with a hiking stick on it, but nothing saying that horses and bikes were disallowed from using the trail. An uncommonly good trail sign by LA standards, but pretty shoddy compared to most trail kiosks around the nation. Note: no mention of what users are allowed on this trail. Of course, if you’re lucky enough to actually have a sign that says there’s a legitimate trail here, you’re already ahead of the curve. Many of the trails, if not most, had incredibly poor signage, to the point that I might see what appeared to be a trail peeling off a gravel road only to doubt a) whether it was legal to ride, b) whether it was unkempt and extremely overgrown due to lack of use, c) an animal trail leading nowhere, or d) the best descent in Southern California. To help navigate despite this lack of trail signs, you might think that you could pick up a comprehensive trail map for the area, but alas, that often will not help you either: many trails in Los Angeles have a frustrating tendency to disappear. On more than one occasion, I spotted a trail on a map and decided to follow it, only to have it lead me off down a narrow canyon and eventually degenerate into an animal trail that eventually disappeared altogether. There were multiple rides that I had planned based solely on trail maps where I had to turn around halfway through due to trails that no longer existed. Urban mountain biking in Fullerton. 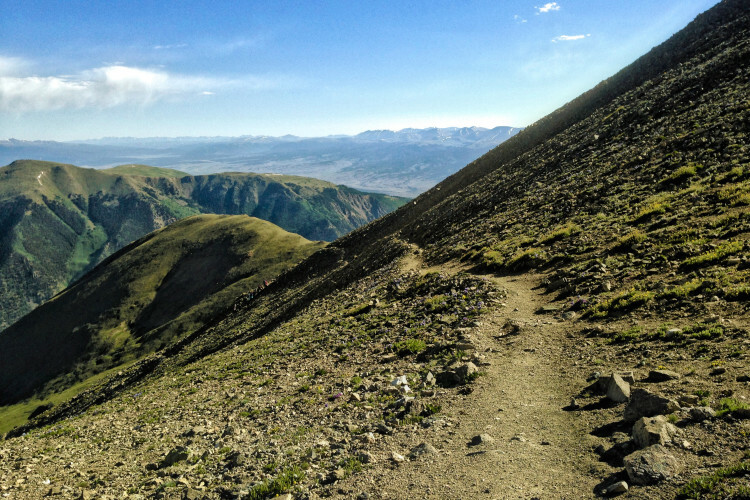 Also, what might look like a crappy fire road on the map may in fact be an awesome, flowy singletrack descent. I rode several routes I thought were going to require long, nasty gravel roads to access a small singletrack gem, only to discover that while it may have been a gravel road at some point in the distant past, the roadbed had been almost completely reclaimed by the shrubby SoCal vegetation, turning what the map claimed to be a gravel road into rip-roaring singletrack! 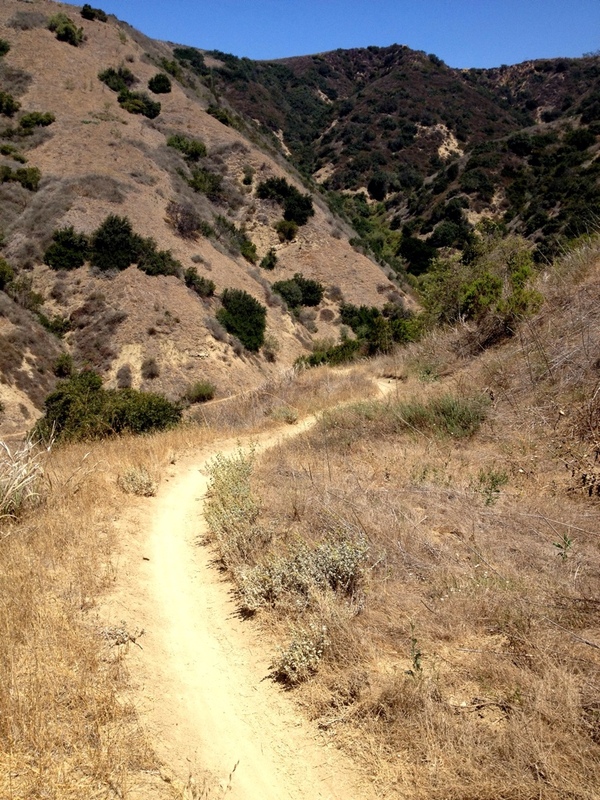 Sweet, legal, relatively well-sgined singletrack: a rarity in the Los Angeles area. If I had to choose between Los Angeles’s approach to trail access and the East Bay area’s approach, I would choose LA without hesitation. While it isn’t ideal, I’d obviously take the legal ambiguity over the flat-out denial of access any day. If you have a run in with a ranger or another enforcer of the law in LA, you can in all honesty claim that you didn’t know you weren’t supposed to be on those trails for at least one, if not more, of the reasons listed above. 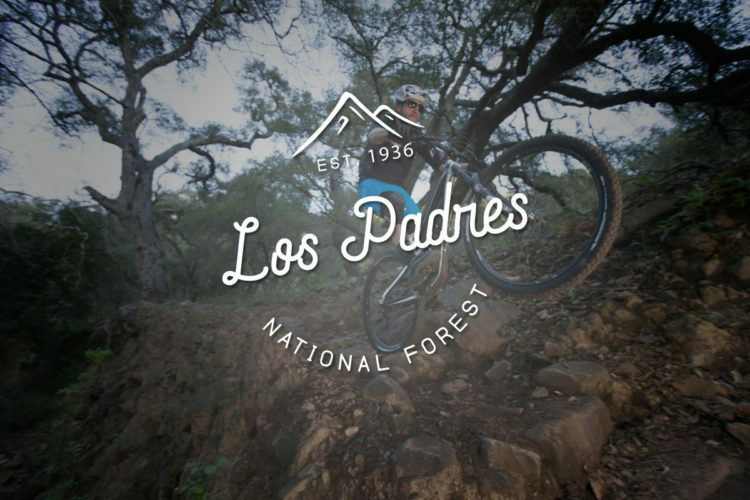 However, this legal ambiguity, lack of trail signage, and other features not mentioned in this article (such as how spread out across the region the individual trails are) all work against the concept of LA as a mountain biking destination of any sort. While LA does provide decent mountain biking for the locals already living there, traveling to the area to ride isn’t my idea of a relaxing vacation. Your Turn: Have you ever ridden an area like LA where the legality of trail access was so ambiguous that it felt like a free-for-all? Where was it? New Bike Legal Singletrack in Marin: Is It Enough? 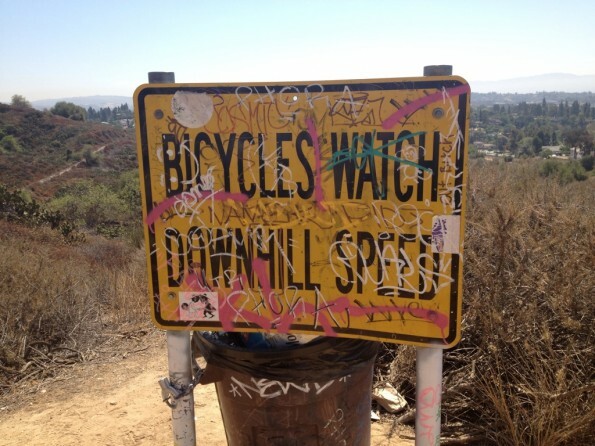 Interesting–I had no idea the trails in LA were so poorly marked. You would think with so many (potential) trail users things would be a little better organized. Still, some of your descriptions make me think of the trails inside the Atlanta perimeter so perhaps the situation is somewhat typical of large (and spread out) metro areas. In big cities people do tend to find ways to coexist and sharing the trail is just another example. Unfortunately I don’t think access ambiguity works as well outside of cities, especially in the eyes of larger agencies like state and federal governments. 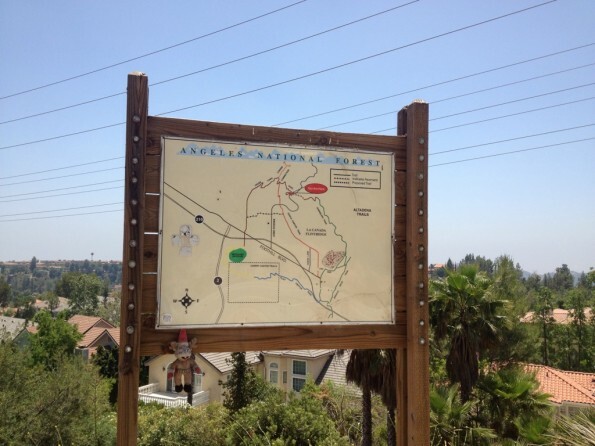 There are a couple exceptions to the rule out in the suberbs… for instance, Aliso Creek Woods that you blogged about was better marked–but even compared to some trail systems in other places of the nation, it wasn’t that great. Interesting take on metro areas in general. I would have liked to have ridden more truly urban trails in the city, but I imagine most of those are much more closely-guarded secrets.